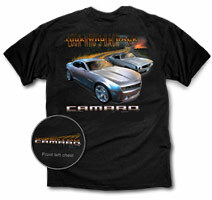 Highly Detailed Small script “Look Who’s Back, CAMARO” on the front left of chest, on this Tee. The script has a sublte graphic of a set of back ground flamed tyre track marks in the road. Just awesome! The main artwork is of the comparison between the 1969 350 small block powered Chevrolet Camaro two door Sport Coupe, and the current generation Camaro sport coupe. Beautifully presented in a brilliant silver body colour, in the back ground is the highly detailed and exceptional looking 1969 SS Camaro, sporting Black tapered racing stripes flanked alongside the guards, the imitation rearward facing chrome hood vents, chrome bright work body trim and badge emblems, with the black vinyl roof . Just simply the best there was! As time went by, the fifth generation Camaro was born. This fantastic edition Camaro by Chevrolet is technologically advanced in speed, handling, safety and feel...Beautifully presented in stunning Silver hue, large 21” and 22” wheels, replica low profile cowl induction hood, the imagery here is just brilliant. The background displays a “sun setting” mountainous winding road, with flaming tyres tracks effects indicating the travel of both these beauties. Below this fantastic artwork is the script “CAMARO” in chrome effect, with the scripts “Look Who’s Back above the artwork.